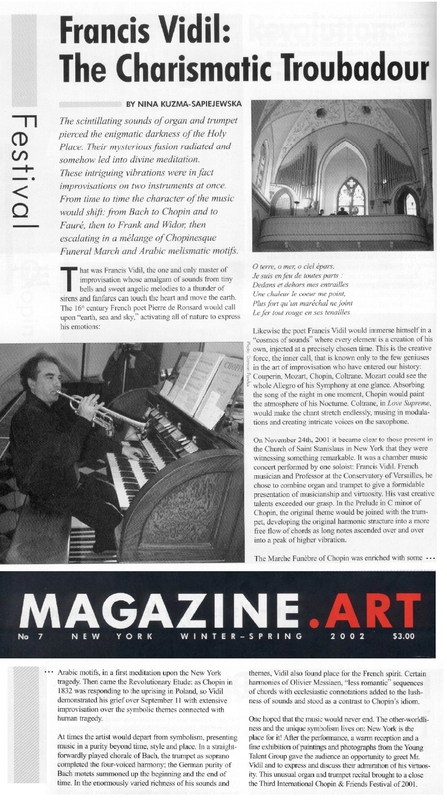 The last article (so far) reviewing the concert of Francis Vidil in Saratov, Russia in 2010. Original of this article can be found here. September is the month when new concerts and theatrical seasons begin. The leader of it is The XIX International organ festival, which well deserves its popularity among Saratov music lovers. Festival organizers gave a truly royal present to the audience this year: for the first time ever professor of Versailles conservatoire, talented organist, pianist and incomparable improvisator Francis Vidil has performed on the Saratov stage with his self-explaining program “Classics and improvisations”. Our newspaper did its best in covering organ festival last season: we introduced reader not only to the new names, sometimes unknown for us, but also with new plays rarely performed on Russian stage. Besides playing the good old classic, almost every musician brought a bit of their own countries by playing pieces of some little-known to us foreign composers. 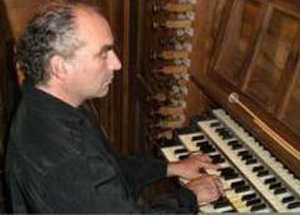 The first act of Francis Vidil’s concert was entirely classical, he played pieces of Louis Marchand “Le Grand Dialogue”, who was a contemporary of Bach, and François Couperin “Cromorne” and “Tierce”, named after the organ registers. Monsieur Vidil has finished his classical part of the performance with “Nocturne”, “Polonaise” and “Prelude” of Frédéric Chopin, who became almost native in France. Saratov’s sophisticated public witnessed these pieces performed by Miroslav Kultyshev during X Heinrich Neuhaus festival (we wrote about it in issue No.10 (524) from 18.03.2010), but you don’t hear that quite often as an organ performance. Organ gives more grandeur to it, fills well-known masterpieces with new colours and textures. According to the maestro Vidil’s words, classical compositions are some kind of a presentation, an opportunity for the audience to meet the performer, but the second act is a pure improvisation, which is born right here, in front of viewers’ eyes. The day before the concert we asked Francis Vidil how can he manage to play such a vast variety of musical instruments? “Well, you can easily write something with your right hand, take a cup with your left one, for example, and push a dog with your leg meanwhile… A man is capable of doing several things simultaneously. So why can’t he play the same way? It is possible.” — assures us Francis. The audience has seen that with its own eyes during the second act of the concert. Prior to the concert Francis said that improvisation “unites us with God, because it lets to change something at any moment of time”. Maestro Vidil offered his viewers to take a little trip, walking from one instrument to another, adopting the language of known instruments, changing it and creating the new music. Many surprises have been born out of mixing contemporary and antique music, as the journey progressed. One little world appeared first around the organ, then piano, trumpet, celesta (which was especially brought on stage from the city opera theatre), chimes, tibetian gong, the second piano, which gave us the opportunity to appreciate Vidil’s performance not only as a organist, but also as a magnificent pianist, when he played grand piano solo. It’s really hard to choose anything single best in this incredible mix – the sound of miniature concert or the piano solo. In the end of the concert a kind of Russian trademark melody took place – “Dark Eyes”, commenced on piano, and continued on organ by “one-man band”. Francis visits Russia not for the first time. He used to play in Moscow, Saint-Petersburg and Petrozavodsk. Finally, Saratov took its chance to meet such a great musician and a person. Besides the evening concert on September 1st, Francis Vidil had performed with massed choir of children arts school No. 8 during the X charitable concert for orphans “France by children’s eyes”. According to our guest, the level of attainment of local musical school students yields to none compare to the European, but the relationships between professors and pupils resemble relationships between elder and younger brothers and sisters, unlike European “strict parents and children” model, which brings more opportunities to develop an creative personality. Unfortunately, maestro didn’t have an opportunity to witness the classes of piano students. But he saw several rehearsals of various faculties’ students while he was visiting the conservatory, and can tell the high professional level of attainment or Russian musical school. Vidil, the maestro of improvisation, thinks that it originates in a depth of Russian soul, because Russians can react and express their feelings of joy, love, fear very emotionally, very acutely and sudden. Improvisation is just intended for Russians, sums up Francis. As a true French and gentleman, who appreciate feminine beauty, Francis noted that all the Russian ladies he met were dressed so very much neatly and beautifully in everyday life, unlike European and American women. Francis liked Saratov’s beauties so mush, that he, according to his own words, was ready to take one of them with him to France. By Nina Kuzma-Sapiejewska, published in “Magazine.Art” No. 7, 2002. The scintillating sounds of organ and trumpet pierced the enigmatic darkness of the Holy Place. Their mysterious fusion radiated and somehow led into divine meditation. These intriguing vibrations were in fact improvisations on two instruments at once. From time to time the character of the music would shift: from Bach to Chopin and to Fauré, then to Frank and Widor; then escalating in a mélange of Chopinesque Funeral March and Arabic melismatic motifs. Likewise the poet Francis Vidil would immerse himself in a “cosmos of sounds” where every element is a creation of his own, injected at a precisely chosen time. This is the creative force, the inner call, that is known only to the few geniuses in the art of improvisation who have entered our history: Couperin, Mozart, Chopin, Coltrane. Mozart could see the whole Allegro of his Symphony at one glance. Absorbing the song of the night in one moment, Chopin would paint the atmosphere of his Nocturne. Coltrane, in Love Supreme, would make the chant stretch endlessly, musing in modulations and creating intricate voices on the saxophone. On November 24th 2001 it became clear to those present in the Church of Saint Stanislaus in New York that they were witnessing something remarkable. It was a chamber music concert performed by one soloist: Francis Vidil. French musician and Professor at the Conservatory of Versailles, he chose to combine organ and trumpet to give a formidable presentation of musicianship and virtuosity. His vast creative talents exceeded our grasp. In the Prelude in C minor of Chopin, the original theme would be joined with the trumpet, developing the original harmonic structure into a more free flow of chords as long notes ascended over and over into a peak of higher vibration. The Marche Funèbre of Chopin was enriched with some Arabic motifs, in a first meditation upon the New York tragedy. Then came the Revolutionary etude: as Chopin in 1832 was responding to the uprising in Poland, so Vidil demonstrated his grief over September 11 with extensive improvisation over the symbolic themes connected with human tragedy. At times the artist would depart from symbolism, presenting music in a purity beyond time, style and place. In a straightforwardly played chorale of Bach, the trumpet as soprano completed the four-voiced harmony; the German purity of Bach motets summoned up the beginning and the end of time. In the enormously varied richness of his sounds and themes, Vidil also found place for the French spirit. Certain harmonies of Olivier Messiaen, “less romantic” sequences of chords with ecclesiastic connotations added to the lushness of sounds and stood as a contrast to Chopin’s idiom. One hoped that the music would never end. The other-worldliness and the unique symbolism lives on: New York is the place for it! After the performance, a warm reception and a fine exhibition of paintings and photographs from the Young Talent Group gave the audience as opportunity to greet Mr. Vidil and to express and discuss their admiration of his virtuosity. This unusual organ and trumpet recital brought to a close the Third International Chopin & Friends Festival of 2001. Traditional XIX International organ festival has opened in the very beginning of autumn by sensational performance of Tenure Professor of Paris and Versailles conservatories, laureate of international contests, Francis Vidil. Francis was born in legendary Versailles in a family of organist. No wonder, in an age of year and half a child with absolute pitch and deep musical traditions in his family was drawn to a mysterious installation with numerous pipes. Organ has become the first musical instrument for little Francis. In Versailles and Paris conservatories he completed studies of playing the violin, trumpet, organ, harpsichord, percussion, jazz piano. His jazz mentor was Roger Guérin, a participant of famous duet with Dizzy Gillespie. During his studying at Versailles conservatory Vidil had received 3 major prizes as a pianist. At an age of 35 he became a professor of that conservatory and established improvisation classes on various musical instruments, which now are major for all the French observatories. Thanks to being somewhat a Mozart look-alike and similar style of playing, Francis played Mozart in numerous cinema and theatrical shows in France. His talent as improvising actor is also highly regarded. He is one of the best concert improvisators in Europe. 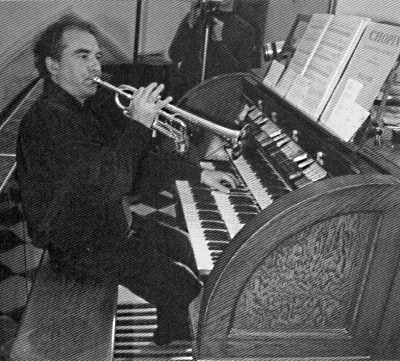 Francis Vidil – the only laureate of the first prizes of major international contests for piano and organ improvisation. He received from the Ministry of culture of France a lifelong position of Tenure Professor of Paris and Versailles conservatories. At the same time he is a visiting professor of Fribourg’s (Switzerland) and Havana’s (Cuba) conservatories, musical faculty of Pennsylvania University (USA). He’s also the organizer and the head of organ improvisations festivals in the USA, Europe and Cuba. And such a wonderful person, thanks to amicable relationship with the organizer of the International organ festival in Saratov Oleg Belotserkovsky, for the first time ever has come to our city, and spent here the entire week. Of course, our French guest has visited the Volga River. But the main thing – he has met students of the children school of arts No. 8 of Zavodsky region, and has performed with its massed choir on the anniversary X charity concert “France by children’s eyes” for the orphans. Suitably continuing The year of France in Russia, Vidil gave a “Classics and improvisations” concert in the conservatory along with a young talented bass singer, the winner of international Delphic Games in Saratov, four-time laureate of international contests Ilya Ivanov. The first act of the concert was classically restrained. Francis brilliantly performed The Grand Polonaise and Nocturne of Chopin, which he called “the very French composer”. But in the second act our guest has performed out of himself at full swing. He utilized (besides the organ) celesta (provided by Saratov’s Theatre of Opera and Ballet), original musical instrument chimes (provided by Saratov’s Philharmonic Society), two pianos, harpsichord, trumpet and something like a gong. The guest called it “Chinese Gong”. The rest of the instruments were found in the conservatory. Francis was talking to the audience freely and easily, made some jokes about the simultaneous playing on the organ and trumpet, and then sat at his major instrument. You should have seen that. He played piano with one hand, and with another took the chords on the organ keyboard, then lightly pinched delicate strings or celesta, or made the noble sound of gong, finishing it at the same time with a low buzz of piano. He really did play the trumpet and “the king of the instruments” simultaneously! The “Dark Eyes” song in different variations – played on a dozen of so unlike musical instruments. Virtuoso has finished his performance almost rowdy – he’s run away from the stage, carrying along with him an attractive blond lady interpreter. And the audience was calling this wonderful artist and musician to play an encore for quite a long time after he left. Translation of the article published in Russian press after Francis’ visit to Saratov, a Russian city on Volga. Francis Vidil is not only the man-orchestra, but also a tenure professor of Paris and Versailles conservatoires, one of the most famous European jazz improvisers on the organ, magnificent pianist and trumpeter. He well deserves the title “The Mozart of France”. Vidil resembles him in appearance and temperament, as well as he virtuously handles various musical instruments. Probably that’s why maestro starred as Mozart in almost all the French movies dedicated to the legendary composer. Vidil’s visit to Saratov was planned a year ago but was postponed. This time nothing can cause a delay, and his performance opened the XIX International organ festival. “To invite me, a musician who can’t make up his mind which musical instrument is his favorite, — my friend Oleg Belotserkovsky is gambling”, — said Francis Vidil prior to his performance. But the audience with the warm acceptance of French maestro, who virtuously plays organ, piano, tibetian gong, celesta (each one of these instruments might take a lifetime to master), demonstrated that to invite him to Saratov was a no-risk bet. Prior to diving into the ocean of improvisation, “The Mozart of France” said: “I take my wristwatch with me to the stage, that will be the only connection with the real world, because all the improvisators get lost in time. Everything that I am going to play now will be a surprise not only for you, but for me as well”. Francis Vidil won the hearts of Saratovians by his charm, humour and unforgettable virtuous improvisation. Those who have seen and heard that will never forget “The Mozart of France”.